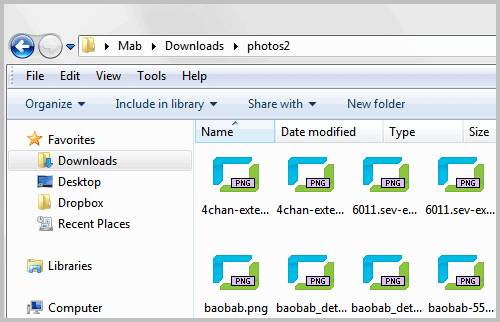 Files and folders can be viewed in various view modes in Windows Explorer. From extra large icons over details and lists to the extended view mode. If you pay attention to the window, you will notice that the header area is not displayed when most of the view modes are selected. Extra large, large, medium and small icon view modes, as well as the list, extended tiles and content view modes are not showing the header when they are selected. Only the details mode is showing headers. Why are headers considered important by some users? Because they can be used to sort files, for instance by name, size or file extension. If you switch to another mode you will notice that the headers are not available so that files cannot be sorted by clicking on the header bar in Windows Explorer. It is still possible to sort files with a right-click and the selection of a sort option under Sort by but that is not nearly as comfortable as clicking on one of the header columns in details view. Vishal over at Ask VG has developed a solution that enables the header bar in all view modes of Windows Explorer. The small program consists of a bat file and a dll that is registered on the system. This dll enables the header bar in all view modes. A click on install.bat after download and unpacking runs a small batch file that registers the dll on the system. The program supports both 32-bit and 64-bit editions of Windows 7 and Windows 7 SP1. You may need to log off and on again or restart your PC before the changes become visible. You can alternatively kill and restart the explorer.exe process for the same effect. If you do not want the header bar anymore in Windows Explorer, you can run uninstall.bat from the same directory to unregister the dll and revert Windows Explorer to its default state. Please note that you need to run the batch file with administrative privileges, the dll cannot be registered otherwise. Windows Explorer looks like the following after registration. You can use the header bar to sort files in Windows Explorer, regardless of the active view mode. Now if only they have this for Android. The Android’s media viewer sorts by date of file ONLY. Can’t sort by anything else. Dumbest implementation I’ve ever seen. Something I would really like is “consecutive” sorting by multiple parameters in Windows Explorer. If I e.g. sort by file extension, files with the same extension will be sorted alphabetically amongst each other – but what I would like to be able to sort them by file size as well? To do this, you usually just have to hold down Ctrl and then click the headers you want to sort by consecutively. I do this on a daily basis in Mediamonkey, my music manager. Total Commander, my all-time favourite love amongst file managers, also supoorts this nifty threading of sorting parameters by holding down ctrl. During testing, the latest version of Explore7Fixes (1.0.0.2) failed to add the sort-headers, but version 1.0.0 worked flawlessly. Testing was done on Windows 7 x64 system. Which version are there offering whit Martin’s link? I really do not know about the version, and why they are linking to Github. I have downloaded the file directly from Ask VG (which links to Deviantart).